Volunteer Spotlight: Jay Buboltz of Roebke’s Run H.T. 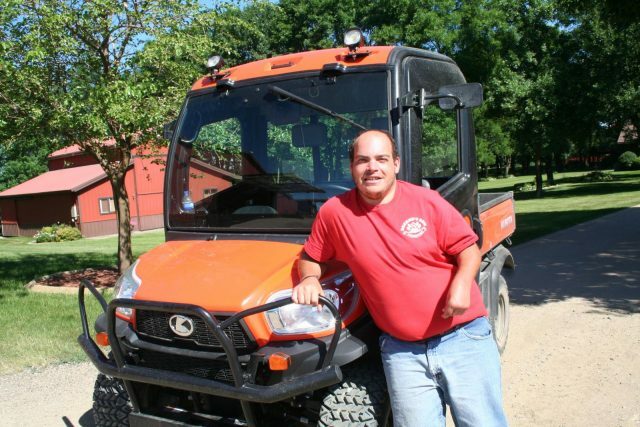 Jay traded in his John Deere four-wheeler for this new Kubota that he used to deliver ice and water to riders during the July Roebke’s Run H.T. Photo courtesy of Pat Schmidt. Behind every horse trial is a significant contingent of volunteers and behind-the-scenes people who do an extraordinary amount of work to ensure that everything goes off as planned and in the time frames allotted. Roebke’s Run Horse Trials in Hector, Minnesota, is fortunate to have Jay Buboltz. The 29-year-old has given his all ever since the very first shows started at Roebke’s Run over a decade ago. If you ask him to do something, he’s right on it, whether it be delivering water and ice to riders from his four-wheeler or doing less enjoyable jobs such as making sure stalls are clean and ready for riders when they arrive. 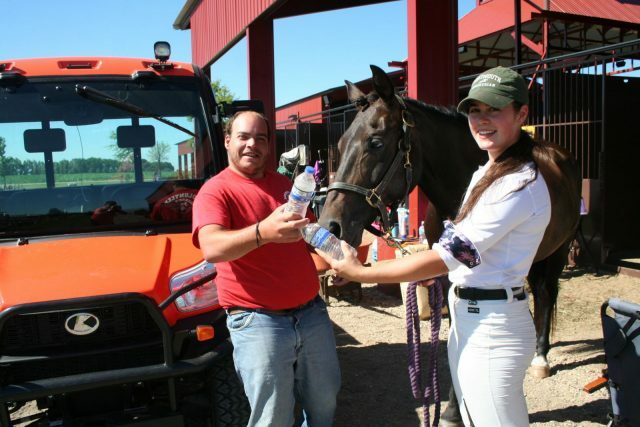 Jay Buboltz stopped to deliver bottled water to Emily Pieper, who was competing in the Beginner Novice Rider-B division with her horse Clovercroft Enterprize. Photo courtesy of Pat Schmidt. Buboltz has been good friends with Mike and Julie Schweiss ever since his high school days. “They put on a really good show here, and I like all parts of it from dressage to cross country and stadium jumping — and Julie does a super job cooking,” he says. When he’s not volunteering at the horse trials, Buboltz likes to fish, ride his new Kubota four-wheeler or play Xbox games. His dad, Randy, also keeps him busy on the farm and at the lake. “Mike, Julie and Brook are really nice people and help me out whenever they can. I look forward to attending every horse show,” Jay says.